occasionally…to afford lip gloss, wine, and boots=) So FYI this post contains a few affiliate links. We have really enjoyed exploring the east coast over the last few months. One place that will never get old is New York City. We had the opportunity to meet up with my brother-in-law and cousin there last weekend. I’ve been scared of this looking forward to this trip for several months…it was our first trip to the big apple as a family! Layla and I went together last year to visit my brother and sister-in-law but Jack was too little and out of control to try and attempt it. We made Layla’s trip a complete surprise. I didn’t prep her at all and my husband just told her “hey, you are going to NYC tomorrow!” when we broke the news. She didn’t really get it and I wished I would have spent more time getting her hyped up about it. So for this trip we bought a really cute book to read to Jack. 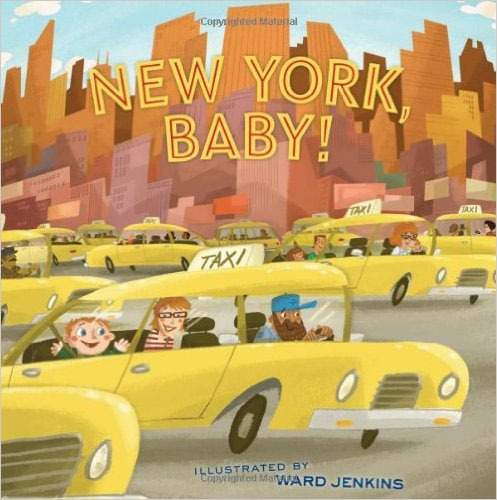 It has fun illustrations and talks about some of the main landmarks like Times Square, Empire State…etc. Jack really loves the book and wanted to read it every night before our trip. Available on Amazon for less than $10! Yep, that’s him pouting because he was getting wet and couldn’t hold his umbrella up. Maybe next time he’ll cooperate with the poncho. Or better yet, maybe it won’t RAIN! The kids did have fun walking around the city with their umbrellas so I’m glad we packed them. Our first stop was the hotel to drop off the car and our bags. Then we walked down the street to catch a train to the museum. Jack had the time of his LIFE taking the subway everywhere. It was nice to have family with us this trip because keeping him off the subway tracks was a challenge. Getting the stroller in and out of the stations was a challenge as well. We have a super light umbrella stroller but it was still rough. We arrived at the American Museum of Natural History via train and saw a huge line to get in through the station. We opted to go outside and wait in the rain, the line seemed to move pretty quick and we were inside in no time. The guys waited in line for tickets while the kids and I walked around the dinosaurs in the lobby. Quick tip- general admission tickets are $22 which is honestly worth it if you will spend the whole day there. If you just want to just stop in or you have a large family and the $22 a pop is hard to swallow, wait in line at the ticket counter and tell them you want to pay for your ticket via donation. You can pay as little or as much as you want! The kids had a ton of fun here, this museum is a great rainy day activity! I think their favorite exhibit was the dinosaurs. It was fun for the adults too!! Jack looks scared in that picture but really he was VERY seriously telling me that the sign “says Dinosaur, Mommy”. After the museum we decided to go across town and visit Dylan’s Candy Bar. If you have kids this is a MUST visit spot. Warning- you will walk out with $100 worth of candy and have NO clue how it happened. If you visit, make sure to go downstairs and do the photo booth. We took a hilarious picture but the computer to share/print wasn’t working. So instead I tried to get a cute picture of the kids playing with candy noodles…it turned into a battle and that had to end quickly. Just down the street from Dylan’s is Serendipity 3 which is another must see place. It’s adorable but I’ll say I was a little disappointed in how not kid friendly they were. It was pouring down rain and they made us leave our stroller outside even though it would have fit under out table no problem. They said they’d help us bag it but never did. The frozen hot chocolate made up for it but if you are traveling here with kids, make sure to do it on either a nice day OR leave your stroller at the hotel. The next day we decided to take the ferry over to Staten Island to have lunch with my brother and sister-in-law. The kids loved being on the train for more than a few stops. This ferry is a best kept secret for NYC travelers. It’s SO cheap, you get an amazing view of the city AND you go right by the Statue of Liberty. There are tons of people outside the station telling you that it takes over 2 hours and you don’t get close to Lady Liberty and you should really pay $40 per person to get on their boat. Don’t do it! The ferry runs every 30 minutes- just hop on and enjoy the views while you go to Staten Island. Once you dock get off the boat and go right back to the waiting area to board the next one back to Manhattan. Should only take you a little over an hour if you don’t wait long for the first ferry. Bonus tips- the bathrooms are pretty clean at the station AND there is a snack bar on the ferry so get a cheap beer for you and some popcorn for your kids! Try to avoid rush hour so the boat is empty. 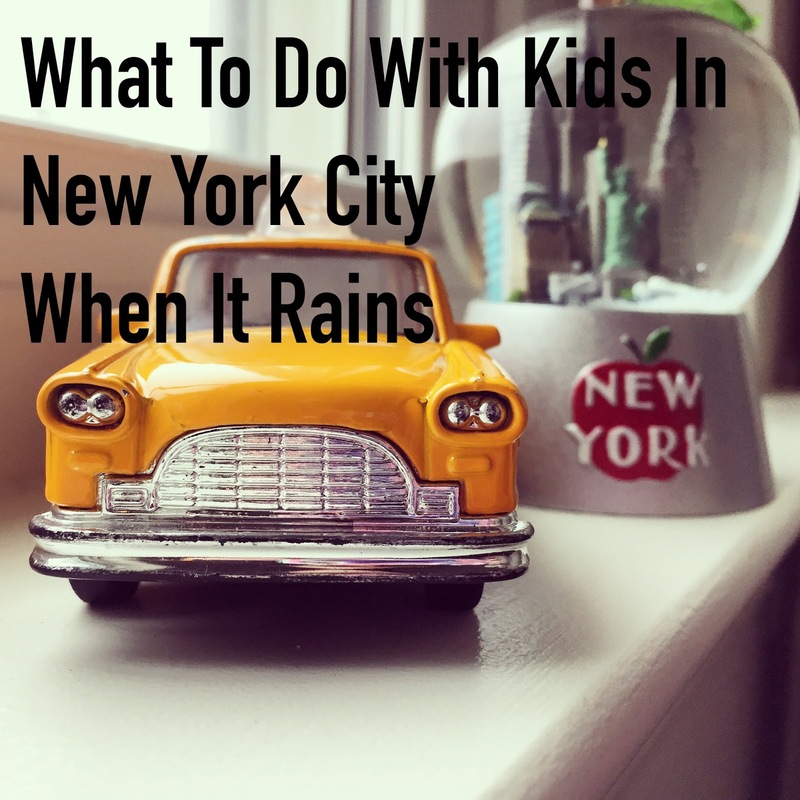 Then your kids can pretend they are NYC locals just commuting home after a long day at the office. LOL! After lunch on Staten Island we went back to Manhattan to see the 9/11 Memorial. It was very easy to get to from the ferry station. The kids didn’t really get it but they did think the water fall was cool. I’m glad our visitors got to see it before heading home. I wish the weather wasn’t so cold and rainy but we made the most of it and squeezed SO much in during our trip. Thanks for coming and for ALL your help Uncle Chris and Nick!! Please don’t rain on us next time NYC! We want to come back during Christmas season…how much do you want to bet there will be a blizzard? « The Story of Diva and Flea – Book Review and Giveaway!